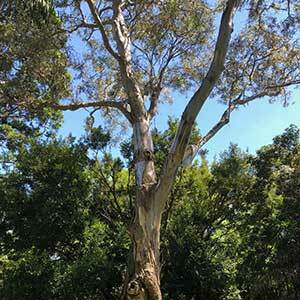 The most widely found of all of the eucalyptus, the River Red Gum is Eucalyptus camaldulensis. An iconic tree that grows along waterways, it is also found dotted across pasture land in many areas of rural Australia. It is the red timber that gives the tree its common name. The timber itself is used for building and furniture as well as fire wood. The River Red Gum is a long lived tree, with many specimens 100s of years old. The flowers are very attractive to bees and the honey produced is well known and prized. Eucalyptus camaldulensis is found from parts of southern Queensland, widley through most of New South Wales and Victoria and through the south eastern part of South Australia. Tolerant of a range of soil conditions, including poorer soils as well as seasonal wet soils, Eucalyptus camaldulensis will grow in most conditions. It is naturally found in areas with ground water of some sort. These are very large trees and require a position in a park or very large garden to do justice to their natural beauty. This is a tree that is salt tolerant and can be used in land reclamation projects. Eucalyptus camaldulensis – River Red Gum Bark. Common Name – Refer Red Gum. Height – To 30 – 40 metres in height. Spread – Will form a canopy of 15 metres plus. Root system – Deep and extensive. Growth Rate – The River Red Gum has a fast growth rate when a good water supply is available. Flowers – White flowers are distinctly rounded, around 5cm across and consist of long white stamens, with no petals as such. Flowers are followed by dry heavy fruit in the form of nuts. Foliage – Mid green. Leaves are generally alternate, ovate to lanceolate and curving. Around 12 to 20 cms in length, aromatic with young foliage having a blue hue, older foliage a dull green retaining some of the blue hue on the underside. 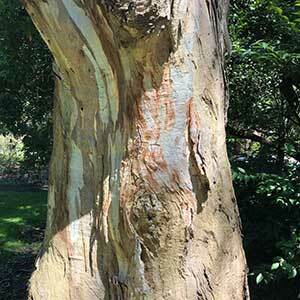 Bark – Bark is a rough, ochre to red to brown and peeling to reveal a creamy white and creamy green beneath.